Stock markets dropped Thursday on profit-taking after a recent run higher on optimism on trade deals, and news on more US tariffs on China, while Argentina's peso and the Turkish lira tumbled. The peso slumped to a new record low, prompting Argentina's central bank to raise its benchmark interest rate to 60 from 45 percent in a bid to arrest a slide in its value. 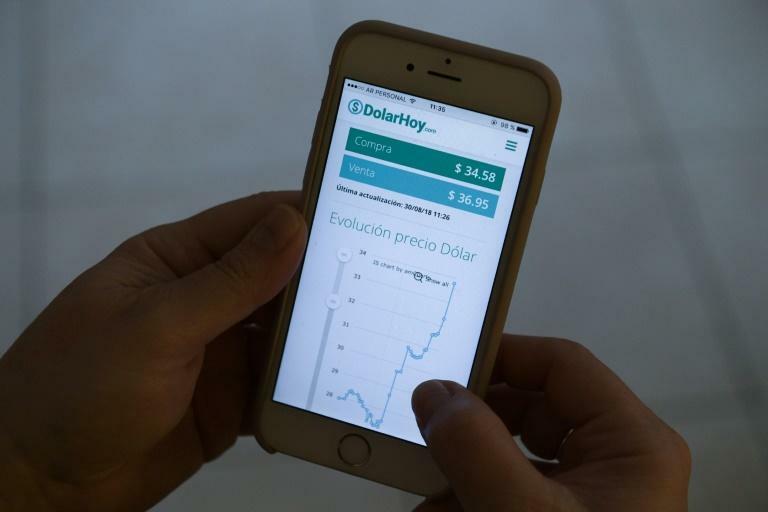 The drop came even after the International Monetary Fund's agreed to consider Argentina's request to speed up payments under its $50 billion loan. The peso fell 13 percent against the US dollar, taking its losses to 20 percent for the week, and about 45 percent since the beginning of the year. "In a context of continued global dollar strength, markets seem to have no mercy for the Argentine peso," JPMorgan said in an analysis. "While it's hard to make a call in a 'panic scenario' ... we are concerned about the medium-term implications of the policy actions triggered by recent volatility." Meanwhile, the Turkish lira suffered fresh losses, losing three percent against the dollar, as a deputy central bank governor resigned. The lira has lost nearly 45 percent of its value against the dollar since the beginning of the year, which led economists to warn of a full-blown recession. The currency had already been hit by concerns over monetary policy under President Recep Tayyip Erdogan but tanked this month after a public spat with the United States. "Things are only likely to get worse," Capital Economics said in a note. On Wall Street, stocks opened lower as investors took profits from a record-setting rally, but sank on news President Donald Trump's next round of punitive tariffs on China could hit as soon as next week. And with a long holiday weekend approaching in the United States, volume was low and price movements more volatile. The S&P 500 fell 0.4 percent, while the benchmark Dow dropped 0.5 percent. Losses accelerated after Bloomberg reported that President Donald Trump wants to move ahead with steep import taxes on $200 billion in Chinese goods, taking the total to $250 billion. The public has until September 6 to comment on the list of goods to be targeted, but several sources told Bloomberg Trump wants to impose the punitive tariffs right after that deadline. That deflated the optimism surrounding talks between Canada and the United States as they appeared close to a deal on rewriting the North American Free Trade Agreement. While hopes were still high for a deal, investors began to worry about other issues, and European stocks suffered as well. London closed down 0.6 percent, followed by a drops of 0.5 percent in Frankfurt and 0.4 percent in Paris. Oil - West Texas Intermediate: UP 54 cents at $70.05.